Corks will be popping from Montana to Massachusetts as the biggest ever shipment of English sparkling wine sets sail for the US today. More than 5,000 bottles of English sparkling wine – the first full container of English wine to be shipped to any export destination – left Southampton docks today, confirming recent reports that demand for English fizz now reaches all corners of the globe. 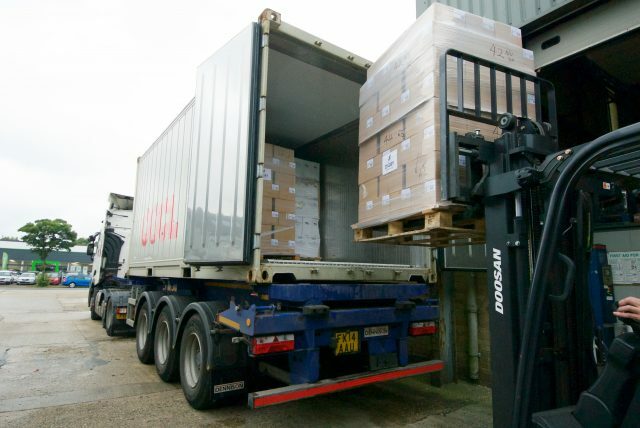 The 20-foot container was loaded with 12 different wines from across the country, including Digby Fine English, Hush Heath Estate, Bolney Wine Estate and Camel Valley. The deal marks an important step towards fulfilling UK wine producers’ recent commitment to achieve a tenfold increase in exports of English wine by 2020, helping to increase their value to over £30 million. The record-breaking shipment has been made possible thanks to a partnership between drinks exporter The British Bottle Company and New Jersey-based Vine Street Imports. The milestone achievement prompted Defra secretary Andrea Leadsom to comment: “The English wine industry is going from strength to strength thanks to the innovation and hard work of our wine growers. “It’s not just our amazing Team GB making gold in Rio – our English wine producers are creating some of the best wines in the world, winning gold after gold at prestigious international awards. Julia Trustram Eve, marketing director of English Wine Producers, the marketing arm of the UK wine industry, said that the shipment illustrated the key priority of the US in terms of global export markets for English wine. “As the reputation of English wine attracts ever more global attention, the USA is a clear priority market for exports,” she said. The British Bottle Company confirmed that the sparkling wines will be distributed to specialist retailers and restaurants across nine states initially: New York, New Jersey, Pennsylvania, Illinois, Washington DC, Massachusetts, Georgia, Montana and Maryland. This first container will be followed by further shipments from The British Bottle Company portfolio in the coming months. The company will also be exhibiting at leading trade fairs as part of the Vine Street portfolio and will organise a number of marketing and brand-building activities, including a wine portfolio launch for US press and sommeliers at the British Consul’s Residence in New York on 13 October. “We ship English wine to markets in Europe and Asia but this is the first time we have shipped a full container of wine to any destination, and what makes it more remarkable is that this is the first order,” Red Johnson, founder & CEO of The British Bottle Company, said. The news of English fizz’s biggest US shipment comes as Cornwall winery announced that it is to begin exporting its wines to Dubai. Two pallets of Camel Valley Brut, Pinot Noir Rosé Brut and Darnibole Bacchus were set to be transported to the United Arab Emirate city. Camel Valley also exports to the US, as well as Japan, Switzerland, France, Germany. The Dubai export channel came about thanks to Camel Valley’s association with Cornwall chef Nathan Outlaw, who was hired to set hired to set up a restaurant in Dubai’s most prestigious hotel, Al Mahara at the Burj Al Arab Jumeirah. Camel Valley wines will also be available to buy in Dubai International Airport duty-free.